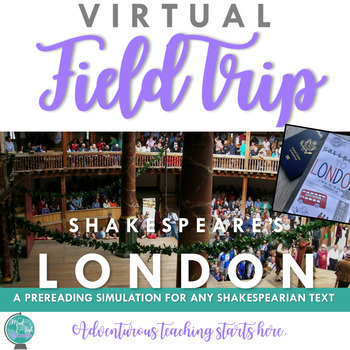 As you’re preparing to teach one of Shakespeare’s plays, host a simulation where students take a virtual field trip to London! 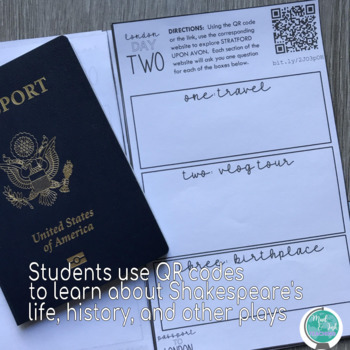 This half digital, half paper experience will provide students background knowledge about The Globe, costuming, architecture, Shakespeare’s birthplace, and also give students the chance to actually “plan” their own trip! NOTE: This product requires the use of YouTube, link shorteners, and Google sites. It is also very highly recommended that you are working with a class set of laptops or Chromebooks. This simulation was inspired by my passion for travel and adventure and how desperately I want to pass that along to my students. In this simulation, you’ll find that the priority for me was to expose students to the possibilities of travel more so than having an extensive knowledge of Shakespeare’s life. 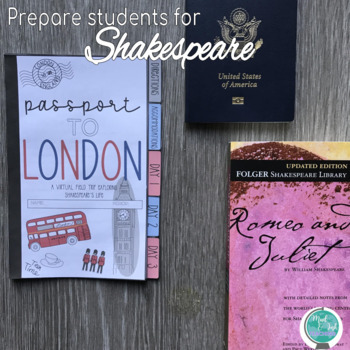 For this activity, I wanted students to see that learning about Shakespeare is something people do outside of school, to experience what it’s like to travel and see historical places in their present-day condition, and to excite students about the real impact that Shakespeare has had on people till this day. So, if you’re looking for an extensive webquest that goes into extreme detail about iambic pentameter, the scandal around his wives, and all of those other juicy details, this might not be the activity for you. This simulation is more about experiencing the places than reading a detailed history of Shakespeare’s life. The lesson is simple: print the flipbook OR simple 2-sided handout, and students follow the QR codes! The Passport to London Flipbook is designed to walk students through the simulation step-by-step so that you can facilitate and walk around to each student as they are working. The simulation includes several YouTube videos from The Globe Experience to individual travel bloggers that will show students both London and Stratford Upon Avon up close. The videos I selected were videos to help students feel like they were actually in London visiting The Globe, Shakespeare's birthplace, and other historical landmarks. Step One: Students will “book” their flights, accommodations, and airport transfers using a variety of websites. Here, students will get a feel for the cost of travel, learn about airport codes, and have fun looking at some hotel possibilities with an unlimited budget! Day One: The first day of exploration will be at The Globe. While “at The Globe”, students will watch videos and analyze visuals to uncover traditions in costuming, the architecture of the stage and seating, and get a backstage look at the famous theater. Day Two: Today, students will “book” a train ride from their hotels in London down to Stratford Upon Avon. Here, they explore the town, tour Shakespeare’s home, Holy Trinity Church, and get an overview about why this town is so worthwhile to visit. Day Three: Finally, on their last day in London, students will have a chance have some traditionally English experiences. From figuring out what “fish & chips” is and learning about tea time, students will be able to explore the more modern attractions of the city. The End: After students book their return flights home, they will reflect on their time in London, what they learned, and whether or not they’d like to visit in real life.